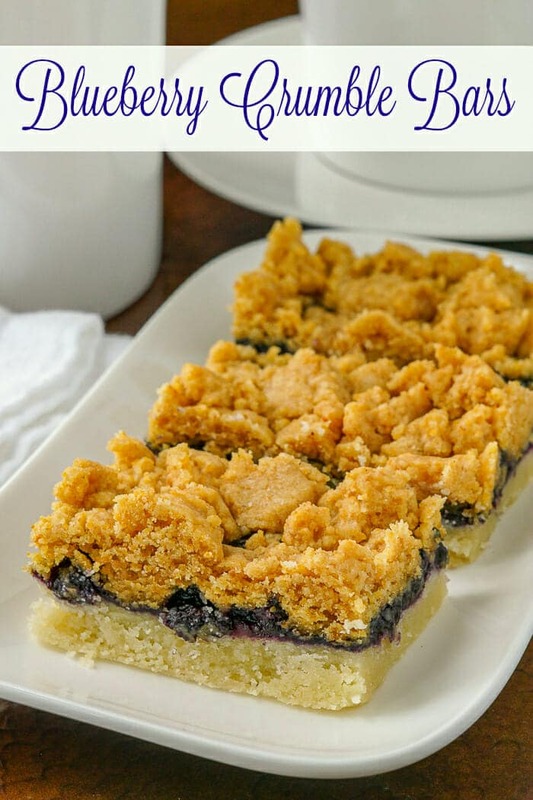 Blueberry Crumble Bars - easy, delectable & freezer friendly too! These Blueberry Crumble Bars have a sweet blueberry compote between a buttery shortbread base and a graham crumb crumble topping; so delectable and freeze well too. Well, we would be remiss if we didn’t add a Holiday treat using some delicious wild Newfoundland blueberries and these crumble bars are just the ticket. We have the best low-bush blueberries in the world here which get particularly sweet and intensely flavoured in the short growing season. 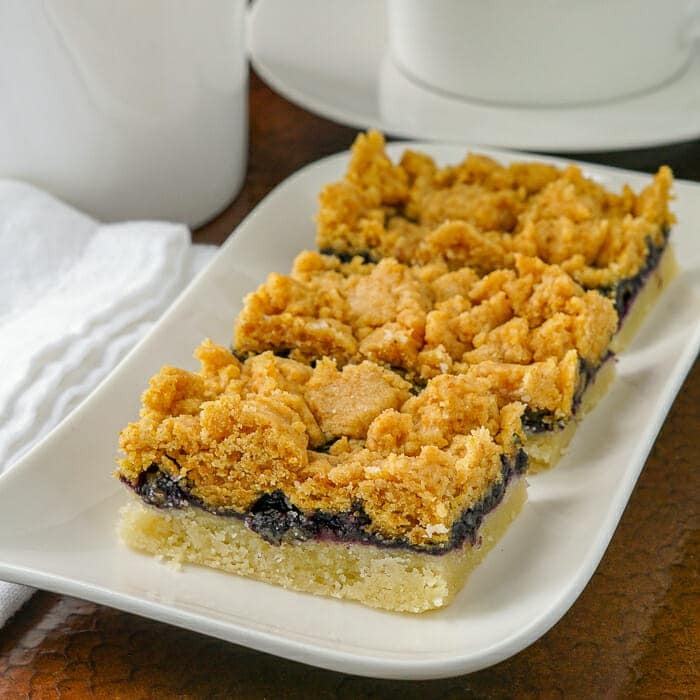 I’ve used them to make a simple blueberry compote to fill these crumble bars with a simple shortbread-like base and a delicious graham crumb crumble topping. Another freezer-friendly recipe to make in advance of your seasonal festivities. 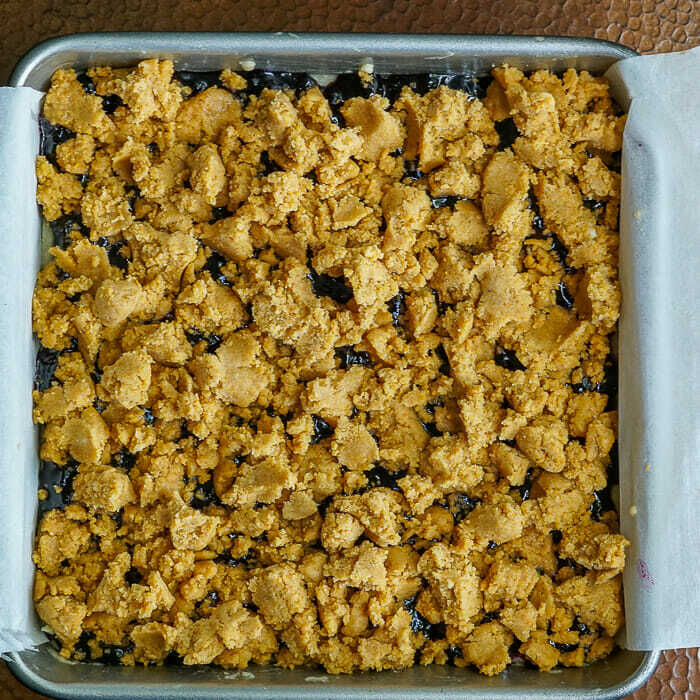 Like this Blueberry Crumble Bars recipe? 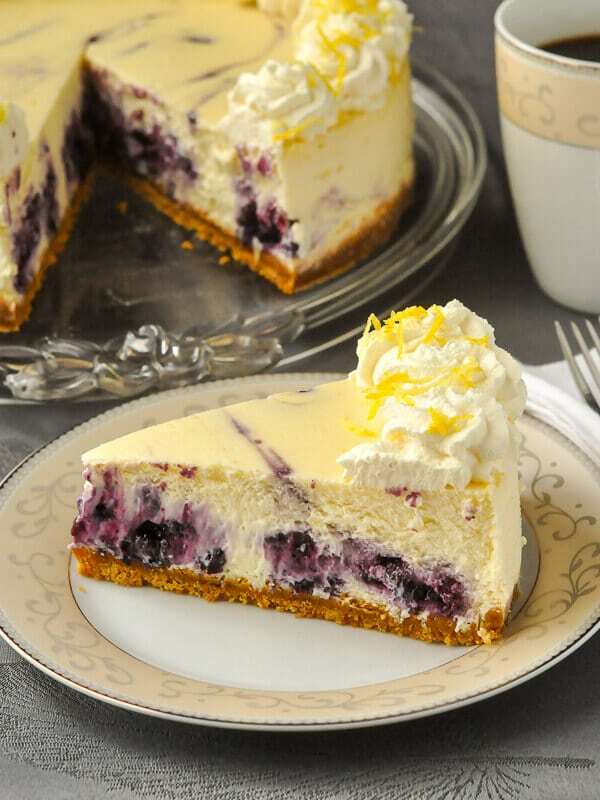 If you’re like me and love blueberry flavour, especially when combined with lemon you’ll love our recipe for Lemon Blueberry Swirl Cheesecake. These blueberry crumble bars have a sweet blueberry compote between a buttery shortbread base and a graham crumb crumble topping. Freezer friendly too! Combine the butter, sugar and flour until the butter is fully incorporated in the flour. You can do this with your fingertips or pulse it together in a food processor if you like. Bring the berries and sugar to a gentle boil. Mix the corn starch with the water and add slowly to the boiling berry mixture stirring constantly. Boil gently for 1 additional minutes stirring constantly. Cool for several minutes, stirring often, while you prepare the crumble topping. In a large bowl, toss together the baking powder, graham cracker crumbs, flour and brown sugar. Using your fingers, rub the butter thoroughly through the dry ingredients. Spread the blueberry compote on top of the shortbread layer. Press the crumble mixture together in handfuls so that it holds together and break off chunks of crumble all over the top of the prepared blueberry compote filling. Press down very lightly and bake for about 20-25 minutes at 350 degrees or until the top is golden brown. This cookie bar recipe is freezer friendly too. These were amazing. I did change the shortbread base for one I like better from another recipe (Sally’s Baking Addiction Caramel Apple Pie Bars recipe) and I subbed half of the blueberries for elderberries, which grow abundantly in Northern Colorado and I almost always have in my freezer, but the rest of this recipe is totally on point and it’s the best recipe I’ve baked in the past year…and I bake all. The. Time. Like 3-4 times a week some weeks. My friends and colleagues were all thrilled recipients of these bars. My climbing partner even posted a photo of him and another climber munching on them at the gym wall. 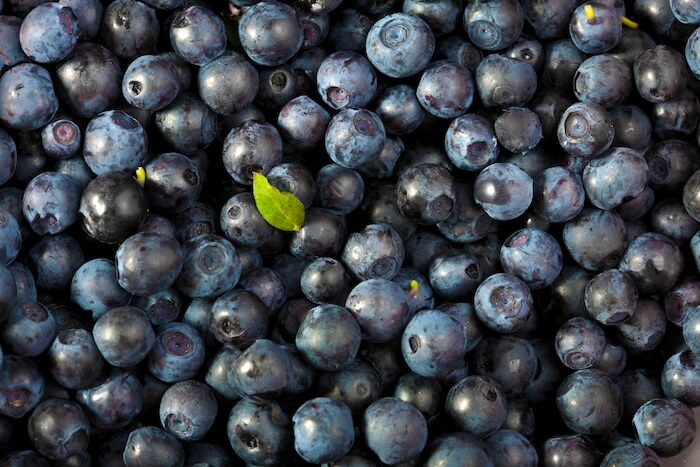 My boss, an avowed blueberry fanatic, absolutely loved these. Thank you. Another wonderful recipe, Barry. Thank you. Great recipe, like everything about it and look forward to baking the other crumble recipes. Thanks! Is looks like there is 4 layers but only instructions for 3… is there something missing? Nope, you are just seeing the bottom browning as an extra layer. It isn’t.